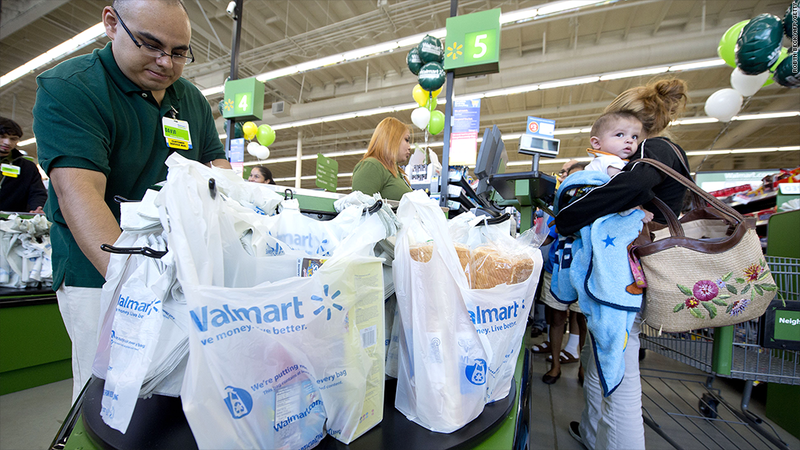 Wal-Mart warned that earnings would be hurt by cuts to food stamp and bad weather. Wal-Mart Stores warned Friday that cuts to the nation's food stamps program late last year will hurt its bottom line. The cut in food stamps went into effect Nov. 1. Food stamps had been increased during the height of the recession, but that expansion expired without Congressional action. The expiration of the program saved the government $5 billion. More cuts in food stamp funding could be on the way. A bipartisan deal on a new farm bill reached earlier this week could trim $90 a month in benefits for 850,000 food stamp recipients, saving the government nearly $1 billion a year. The nation's largest retailer also said bad weather was affecting its financial performance. Additionally, the company said it will also have to take a charge related to previously-announced plans to cut 2,300 jobs and close some of its Sam's Club wholesale stores. The warnings mean the company will report a drop in earnings in the quarter that ends Friday. A year ago, the company reported it was hit by the expiration of a temporary cut in payroll taxes, which it said caused sales to fall in the first quarter. Shares of Wal-Mart (WMT) fell in early trading.